For complex preservation projects like Bostwick, the actions of documentation and designation are accompanied by a planning process, in which the structure’s physical condition, reuse potential, and community context are considered in preparing a preservation strategy for the site. The Historic Structure Report (HSR) is a comprehensive preservation document that addresses these topics through historical research, structural and material analysis of the building, and recommendations for restoration and rehabilitation. Historic Structure Reports, along with other planning documents and studies, serve as resources and guides for all of the parties involved in the preservation effort. Kathy Manicke, a 2007 graduate of the HISP program, produced the HSR for Bostwick. A link to the HSR is provided below, along with several other Bostwick reports and studies that have been prepared for the Town of Bladensburg in recent years. Manicke, Katherine. “Building at Risk: A Historic Structure Report for Bostwick in Bladensburg, MD.” Master’s Thesis, University of Maryland, 2007. The following report was produced by graduate students in the Historic Preservation Fall 2010 Interdisciplinary Studio sponsored by the Colvin Institute of Real Estate Development at the University of Maryland, College Park. It outlines two redevelopment and design proposals that the graduate students developed for Market Square in Bladensburg, Maryland. The proposals are informed by in-depth interdisciplinary research conducted about the town, including interviews with Bladensburg residents and stakeholders, historical research, and analyses of demographics, infrastructure, the physical landscape, and residential and retail markets. This serves as an interim report on the ongoing dendrochronological sampling project being carried out at Bostwick House. Part of a collaboration between students in Historic Preservation 655: American Vernacular Architecture and the Oxford Tree-Ring Laboratory, the project introduces students to the practice of tree-ring dating through dendrochronological analysis by taking a small sample of Bostwick's roof timbers each time the course is offered. A final report will be produced once six to ten samples have been collected, the normal amount for a complete dendrochronological study. As part of an ongoing relationship between the University of Maryland and the Town of Bladensburg, this Historic Preservation studio project was developed in 2011 to explore recommendations for a new use of Bostwick. The recommended scenario builds upon the strengths of the Bladensburg community and the unique heritage of Bostwick. 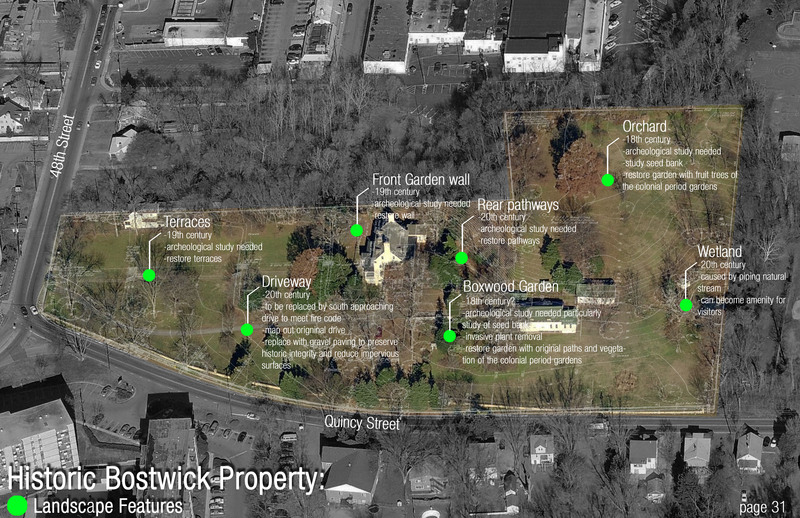 A summary of the history of Bostwick in relation to the grounds and landscape, details of the Colonial gardens, and letters from Rebecca Stoddert, the home's second owner. To accompany the report are maps of the historic landscape and historic buildings. Selected images of Rebecca Stoddert's letters are available under primary documents. This report is an analysis of mortar sampled from the mid-eighteenth century Bostwick House. John Milner Associates, Inc. collected both pointing and bedding mortar samples from joints on the brick building. One representative sample was selected for analysis: historic pointing mortar (MA01). The purpose of this analysis is to determine the physical composition of the earliest mortars for replication during the restoration of the building. Burritt, Lane. “Mortar Analysis and Paint Removal Field Testing for Bostwick Bladensburg, Maryland.” John Milner Associates, Inc., December, 2007. 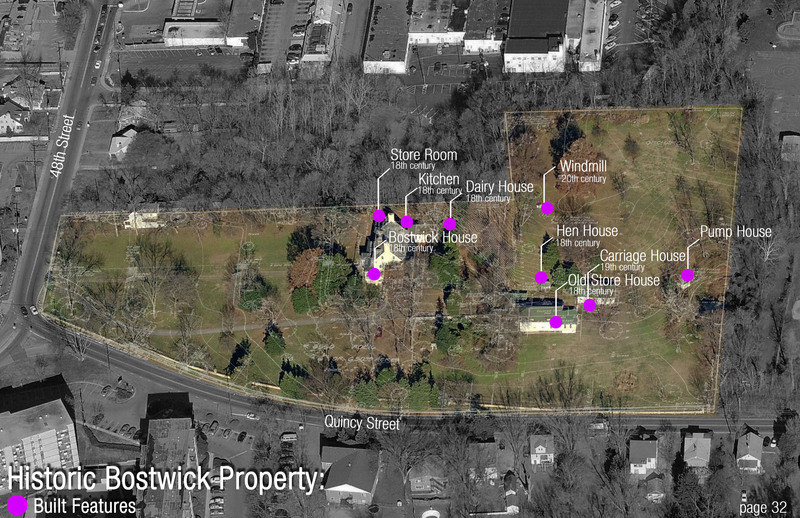 A study initiated by a partnership established between the Town, the Prince George's County Community Development Corporation, and the Historic Bostwick House Partners Workgroup. As a result of this study, the consultant team defined three alternative scenarios for the Bostwick house and property for further evaluation. These are described in detail in this report. “Feasibility Study for the Adaptive Use of the Bostwick House and Property.” Final Report, Rhodeside & Harwell Inc., Bay Area Economics, John Milner Associates, Inc., A. Morton Thomas Associates, Inc., December, 2002. The following represents a summary of our assessment of structural conditions and required structural repairs at Bostwick, a home built in 1746, along with three of the outbuildings – the Kitchen, Stable and Shed. Following upon our initial survey and evaluation of probes, we have developed preliminary designs for structural repairs for the main house which are to be used for pricing. Wood samples were taken from the main timber beams and floor joists and were evaluated in a testing laboratory. The laboratory findings indicate the wood samples were all white oak and presented no evidence of material deterioration. The report is attached herein for reference. “The Bostwick Property: Structural Assessment and Recommendations.” Robert Silman Associates, PLLC, February, 2004.